FRONTeO Branch banking is a modular front & middle office solution covering all banking services and specifically designed for the needs of the branch network. The functional coverage includes client management, accounts, loans, payments, insurances, investments, teller management and web contract subscriptions. These modules are designed as reusable components, thus allowing banks to be more productive, reduce their costs and improve the quality of their services. Loans : Management of the loan acquisition process for consumer loans, installment loans, mortgage loans, investment credits, commercial loans, term advances, revolving credits and leasing. 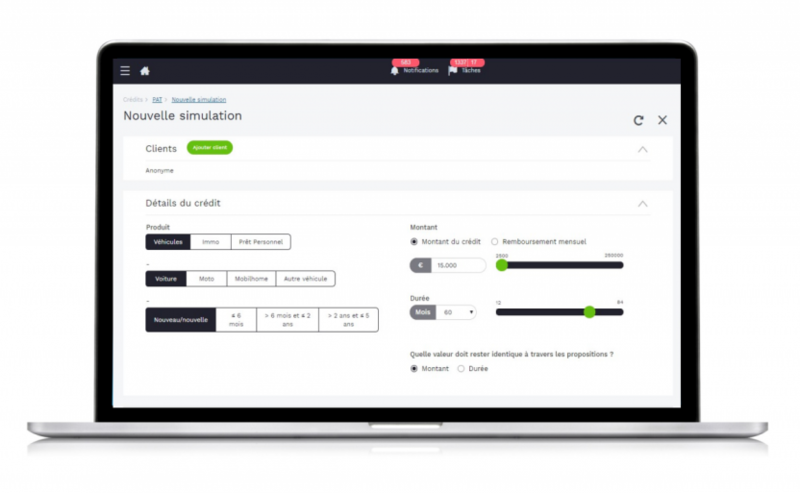 Including advanced scoring and simulation tools, functionalities for complex loan constructions and credit structures, wizard style-GUI for easy and systematic acquisition management, collateral management, contract management, interrogation of external business information providers such as central credit registers or credit re-insurers. Investments : Management of portfolio, buy/sell funds and certificates, securities management tools, global portfolio view and transaction history. Web contract subscription : Management of web contracts, accounts, (multi-)signing authorities, authentication and authorizations. Insurances : View on all insurance products of the client. Investment advice : Standardization and automation of the complete investment advisory process. the solution integrates official and custom black-lists. Become client : Follow-up and management of the become client requests initiated through the public website. 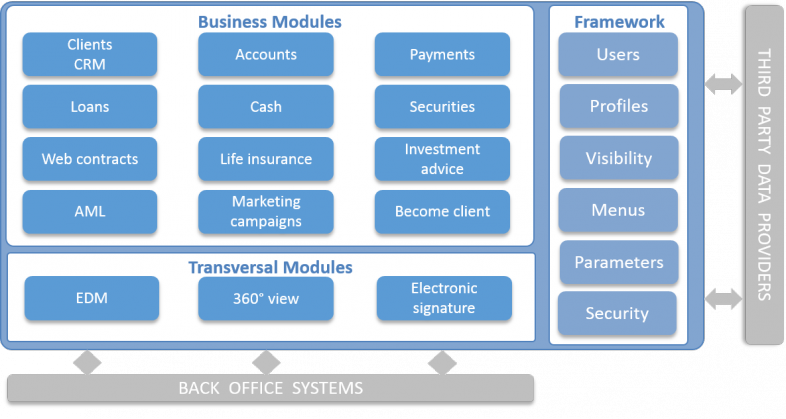 FRONTeO Branch is based on a new product architecture. To meet the challenges of the omnichannel, MAINSYS has redesigned the architecture by significantly changing its technology platform. New components (BPMS, BRMS, Communication Manager, ...) provide agility and ease of implementation to launch new services and new products quickly. We do not propose different channels independently but rather accompany the customer journey through different channels, whatever the starting channel. The customer is lead to the most comfortable channel to complete the ongoing task. Discover the advantages of this new architecture. By installing FRONTeO, a financial institution benefits from numerous advantages: the solution can be connected to any back-office system, is multilingual, modular, SOA based, user friendly, scalable and offers excellent reporting possibilities. Moreover, FRONTeO has been developed using market standards, significantly reducing the total cost of ownership (TCO).